Line reactors provide an economical means of mitigating harmonics generated by non-linear loads such as variable speed drives, and can also help to minimise "notching" in thyristor controlled rectifiers. Feel free to contact us on 03 9720 4522 or sales@practicalcontrol.com.au to discuss your specific needs. 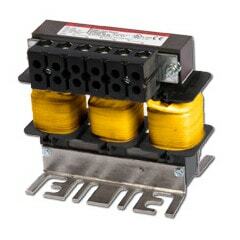 Listed below are 480V models, 600V models are also available.